Atty. Reynaldo Robles admitted that Senator Antonio Trillanes IV could not find his copy of the amnesty application form he filed for his amnesty, during the hearing Makati City Regional Trial Court Branch 150. 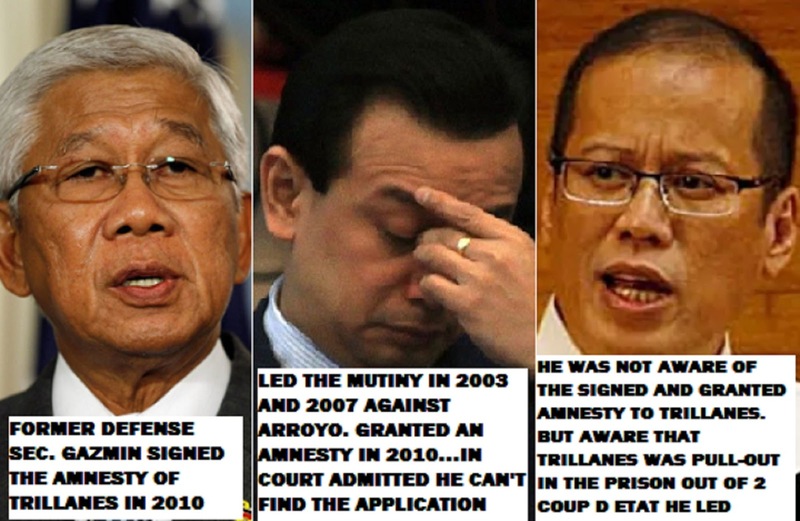 Despite of the absence of the copy to authenticate the initial requirement, he was still granted an amnesty in 2010 signed by former Department of National Defense Secretary Voltaire Gazmin under Benigno Aquino administration. During the hearing, Robles presented supporting documents and videos to validate the grant of Trillanes. But Judge Almeda stressed out that the court does not accept secondary documents. DOJ prosecutors, led by acting Prosecutor General Richard Anthony Fadullon and Senior State Prosecutor Juan Pedro Navera, maintained that because of Proclamation 572 revoking Trillanes’ amnesty, the court’s dismissal of the rebellion case seven years ago is void. And swears to present future documents for Trillanes' arrest.